Smoke alerts were triggered inside the cabin of the ill-fated EgyptAir jet minutes before it plunged into the Mediterranean Sea with 66 people on board, according to new details emerging shortly after human remains, luggage and seats were found by searchers. Smoke was detected in the toilet and the aircraft's electrics, just minutes before the signal was lost, according to data published on air industry website the Aviation Herald, which said it had received flight data filed through the Aircraft Communications Addressing and Reporting System from three independent channels. The fresh details follow Egyptian military's recovery of debris, passengers' belongings, body parts, luggage and aircraft seats from the ill-fated EgyptAir Flight MS804, en route from Paris to Cairo, even as the crucial black box has not been found. The Herald said the system showed that at 02.26 local time on Thursday (05.56 IST) smoke was detected in the toilet of the Airbus A320. Just a minute later -- at 05:57 IST -- there was an avionics smoke alert. The last ACARS message was at 05.59 IST, the air industry website said, and the contact with the plane was lost four minutes later, which was 02:33 local time. "(The data) doesn't tell us anything, whether it's an explosion because of a bomb or because of a mechanical fault, but immediately it narrows down the area that we're looking at," CNN aviation analyst Richard Quest said. "We're now no longer worried about wings or what else might have happened, or other flight control surfaces," Quest added. The discovery of the wreckage of EgyptAir Flight MS804 near Alexandria came as the navy continued to sweep the area looking for the plane's black box and bodies. The Egyptian presidency expressed its "deep sadness and extreme regret" over the deaths of the people on board the jet, in the first official recognition of the tragic crash of the missing plane. The Airbus A320 "swerved and then plunged" into the Mediterranean, according to authorities. The plane, on its fifth journey of the day, was travelling at 37,000 feet when it disappeared from radar. It had made a stop in Tunisia before flying to Paris. Two babies and one child were on board the plane carrying 56 passengers and crew of 10, according to EgyptAir. Philip Baum, the editor of Aviation Security International Magazine, told the BBC that technical failure could not be ruled out. "There was smoke reported in the aircraft lavatory, then smoke in the avionics bay, and over a period of three minutes the aircraft's systems shut down, so you know, that's starting to indicate that it probably wasn't a hijack, it probably wasn't a struggle in the cockpit, it's more likely a fire on board. "Now whether that was a technical fire, a short circuit, or whether it was because a bomb went off on board, we don't know," he added. Meanwhile, Greece's lead air accident investigator, Athanasios Binis, was that the "point of reference" was an area 130 miles south of the Greek island of Karpathos. The location is now the centre of a major international air and sea operation to find the plane's black boxes. "There are three reasons for a plane (to go down)," he said. "Meteorological, technical and human. The first has now been ruled out because the weather was quite good. Whether a technical factor or human factor, either inside or outside the plane, is to blame remains to be seen. All possibilities are open," Binis was quoted as saying by the Guardian. European Space Agency satellites spotted an oil slick in the area where the flight had vanished -- but the organisation said there was no guarantee it was from the plane. 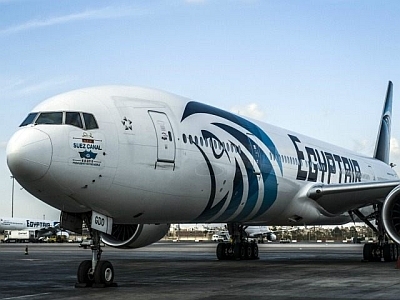 The aircraft had lost contact with radar early Thursday above the Mediterranean Sea about 280 kms from the Egyptian seacoast at 02.30am (local time) as the flight was expected to arrive CairoAirport at 03.15 am (local time). The tragedy had raised fears of a repeat of the bombing of a Russian passenger jet by the Islamic State over Egypt last October that killed all 224 people on board. However, no group has claimed responsibility so far of the crash.